Kürtőskalács: I found many different translations on the web : chimney cake, stove cake, spit fired donuts (?) .The cylinder shape recalls the shape of the stove pipe or chimney pipe hence the name "kürtő". "Kalács" means challah. Originally it comes from Transylvania as a holiday bread/ wedding cake and lately became a real street attraction both there and in Hungary. People hardly ever make it at home because of the tools it requires but as you will see it is not impossible! In a BIG bowl mix dry ingredients. Mix milk, melted butter and the eggs. Add it to dry ingredients. Knead it for a couple of minutes either by hand or by a wooden spoon: this can be done by pulling the dough towards you with the spoon and keep turning the bowl.This should not take more than 2-3 minutes. When touched and the dough doesn't stick to your fingers cover and let it rise for about an hour. Then punch down the dough and give it another 15-minute rest. Now it's ready for grilling! OK, you've got the dough, you've got the "sticks". Now you just have to get the fire going. Use a lot of charcoal and let it all burn down. When there are no more flames then get ready for a Culinary Experience!! Use a handful of dough and on a wooden board roll it int0 a 1/2-inch (1/2 cm) thick "rope". Next coat the wood with oil. Holding it in your right hand make a loop on the top with the dough tucking in the end. 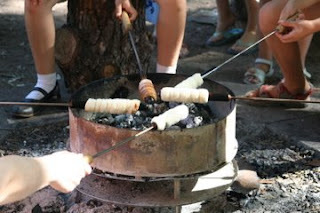 (photo) Keep rolling the stick (holding it by the steel part) and at the same time gently pull the dough to the left and wrap it on the wood. When you run out of dough simple tuck in the other end. This way the dough -hopefully- will stay on the wood tightly and will not get loose during baking.Next lay it on the wooden board and give it a couple of gentle rolls to even the dough. Coat it with oil, then with sugar and go for the grill! Hold it far enough from the charcoal so it doesn't burn yet it bakes through and KEEP TURNING IT slowly! Thanks to the long handle you don't have to stand too close to the heat. After some time (?) the sugar should be changing color and caramelizing. I would say if the heat is right (hot enough but not TOO hot) maybe 2-3 minutes. It needs to reach a dark brown color! (photo) If it browns too quickly, just hold it further away from the heat and if it takes way too long (specially towards the end of your batch) you should move it closer.Just before it turns into ashes (just kidding....) meaning it is nice dark and shiny quickly coat it with one of the above mentioned finishing "flavors" You kind of need to be fast -before the caramel solidifies- so the "flavors" can stick to it. You can also leave it as is, with just the caramelized sugar. Use a fork to remove it from the stick (Careful, VERY hot and STEAMY!) Enjoy! Check out this blog for more and don't miss this video. I did find his blog when I was searching for other sites about this dessert. Good job! I am glad you ventured on this field. I desperately need to find some way to make/buy a couple of the sticks they use to make this. Can you tell me what they're called exactly or where I might be able to buy them? Thank you.